With the announcement of the Boltzmann Initiative and the recent releases of ROCK and ROCR, AMD has ushered in a new era of Heterogeneous Computing. As part of this initiative, we have also updated the CodeXL GPU Profiler to support the ROCR runtime. The CodeXL GPU Profiler allows you to profile any application built on top of the ROCm Platform, whether it is built using HCCompiler, HIP, Continuum Analytics Anaconda, or even if the application is built using ROCR APIs directly. Although this article refers to profiling applications based on the ROCR runtime, the CodeXL GPU Profiler currently uses the term “HSA” to refer to ROCR. This is because ROCR is based on (and nearly identical to) the HSA Foundation runtime APIs (as mentioned in this blog post). The CodeXL GPU Profiler exists in two forms: a command line version which can be run on any machine that supports ROCm (even headless systems), and a version which is integrated into the CodeXL GUI client. If you are unable to run the CodeXL GUI on the target system, you can collect profile information using the command line version and later import the resulting data files into the CodeXL GUI running on a different system. This article focuses on using the command line version of the profiler. The executable is called “CodeXLGpuProfiler” (formerly known as “sprofile”). For information on using the equivalent features from the CodeXL UI, please refer to the CodeXL documentation. Before looking at the profiler’s features, it is first important to understand how different versions of the profiler relate to versions of the HSA/ROCR runtime. Typically, a particular profiler release will target a specific ROCm release. Be sure to check the profiler documentation for specific information about which runtime release is targeted by the version of the profiler being used. Also, because the CodeXL release schedule is on a different cadence than the ROCm release schedule, it is likely that you may need to replace files in a CodeXL release with files from the ROCm Profiler GitHub repository when using a specific release of the ROCR runtime. The documentation in GitHub will include information on what files need to be replaced. Now, let’s take a look at the profiler features. The profiler supports two modes: Application Timeline Trace mode and Performance Counter mode. 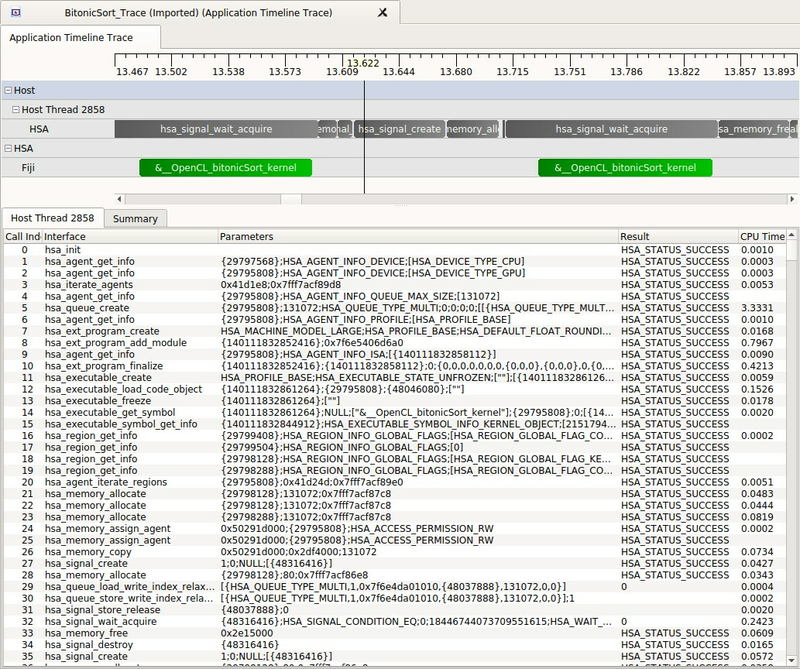 In the Application Timeline Trace mode, the profiler tracks all HSA/ROCR runtime API calls made by the application. For each API, it records the parameters passed into the API, as well as the return value of the API. It also collects CPU-side timestamps for each API – these can be used to see how long each API takes to execute. 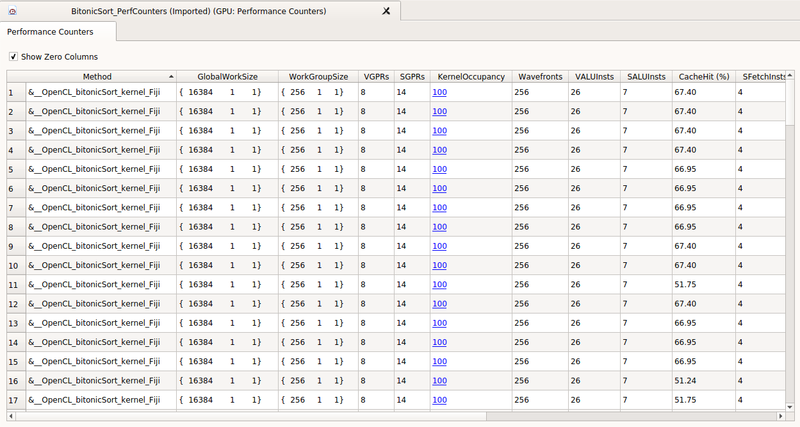 What’s probably more interesting is that in this mode, the profiler also tracks each kernel dispatched to the GPU. For each kernel, it reports some information about the kernel (kernel symbol name, the queue used to dispatch the kernel, the name of the device where the kernel was dispatched), and also timestamp information for the dispatch. Using these timestamps, you can determine how long a kernel took to execute on the GPU. Using the data collected in this mode, the profiler can also provide summary information about the APIs called and the kernel dispatches. It can also report some common API usage warnings and errors. 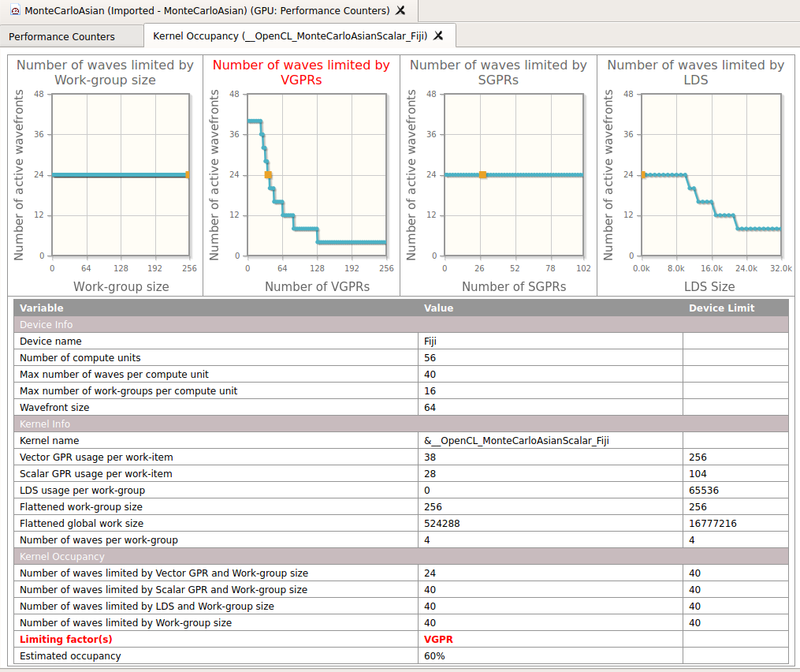 In the Performance Counter mode, the profiler can collect performance counter values directly from the hardware for each kernel dispatched to a GPU device. This data can be used to analyze behavior and performance characteristics of each kernel. Performance counters can give you insight into memory usage, cache usage, and thread divergence within a kernel, among other things. When collecting performance counters, you can also optionally collect kernel occupancy information which can be useful to see how a particular kernel’s resource usage affects the number of in-flight wavefronts for that kernel. Both profiler modes can be useful, and together, they give important information about where possible bottlenecks may exist in your application. 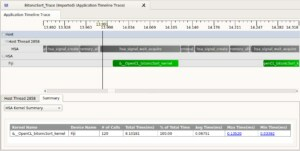 An Application Timeline Trace Profile can give you an overview of both CPU and GPU side execution of your application. It can help identify which dispatches are taking the most time in an application. 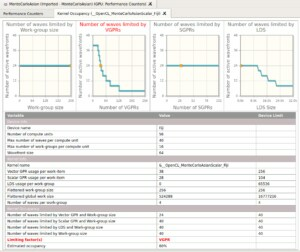 Once you’ve identified expensive kernels, a Performance Counter Profile can help identify possible opportunities for optimization of a specific kernel. A few of the most-used options are shown in the table below. A full set of options can be found in the CodeXL documentation or by running “CodeXLGpuProfiler -h”. 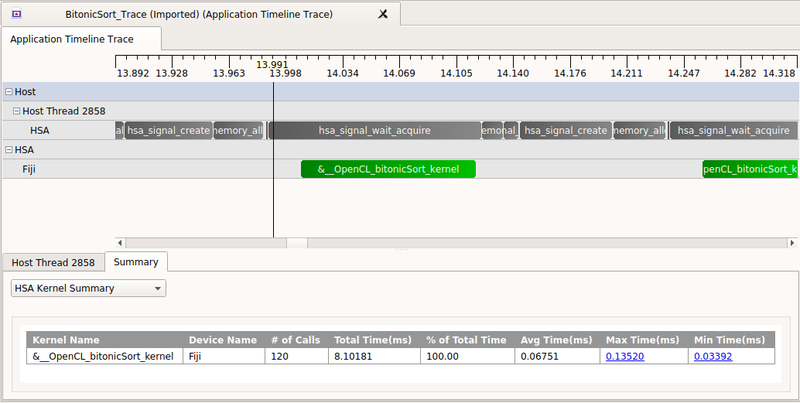 –hsatrace, -A Trace HSA application and generate CPU and GPU time stamps and details API call traces. –hsapmc, -C Get the performance counters for each HSA kernel dispatched by the application. –tracesummary, -T Generates summary pages from an .atp file. When used with –hsatrace, it is not necessary to specify the .atp file name. If you want to generate summary pages for a previously-generated .atp file, you can specify the .atp filename using the –atpfile option. –outputfile <arg>, -o <arg> Path to OutputFile. The default is ~/Session1.csv when collecting performance counters or ~/apitrace.atp when collecting an application trace. 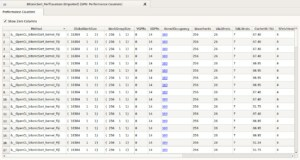 –list, -l Displays a list of available performance counters. –counterfile <arg>, -c <arg> Path to the counter file to enable selected counters (case-sensitive). If not provided, as many counters as possible will be enabled. The counter file should contain one counter name per line. –occupancy, -O In addition to collecting performance counters, the profiler will also collect kernel occupancy data for each kernel dispatched. Alternately, you should be able to drag an .atp file or .csv file from a File Browser or Windows Explorer view and drop it onto the CodeXL Explorer. We won’t go into details about the CodeXL UI here, however, some screen shots of the resulting data displayed in CodeXL are shown below. Note: all output files are text based files, so if you are not able to view them within CodeXL, you can still view the results using your favorite text editor. The format of most output files is also well-structured, meaning it is possible to write scripts that parse and analyze the data. Chris Hesik is the GPU Profiler technical lead for the Developer Tools Group at AMD. Links to third party sites are provided for convenience and unless explicitly stated, AMD is not responsible for the contents of such linked sites and no endorsement is implied. those tools was removed in codexl 2.4 ?